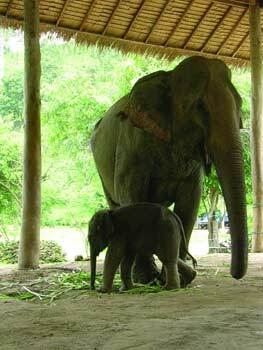 Pick up from your hotel at 0830 and drive to the Mae Sa Elephant Camp,approx. 12kms north of Chiang Mai. You will see a show where the elephants demonstrate some of their many skills. Afterwards you will take a ride on one of the elephants (approx. 1hr) around the area. From the elephant camp we go to one of the largest orchid farms in the Mae Sa Valley, where you will see a stunning selection of these beautiful flowers. Then take lunch in the Mae Sa valley area and in the afternoon drive up to Doi Suthep temple, which is approx. 12kms from downtown Chiang Mai. The majority of the route is a winding uphill journey passing through Doi Suthep National Park. At the base of the hill you will pass Chiang Mai Zoo and the Kruba Srivichai Monument. Once at the temple you can admire the magnificent views over the temple valley as well as the temple atmosphere and architecture. The highlight is the inner sanctum which houses the enormous golden stupa. Tour around the temple and drive back down to Chiang Mai. Visit one of the main temples in the city area before returning to your hotel (approx 5pm). Notes: This is a private tour; entrance fees and lunch are included. The Khantoke dinner is join in transport and dinner/show, (private transport available at extra cost, on request). 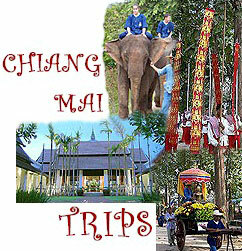 This tour is a private trip to visit Mae Sa Elephant Camp and to take an elephant ride. You also visit the famous temple of Wat Phrathat Doi Suthep, which overlooks Chiang Mai and one of the famous city temples. In the evening you attend a Khantoke dinner. Lunch & entrance fees are included. Khantoke dinner/show on a join in basis (private transport available at extra cost on request). Pick up and drop off at your hotel.